Trying to reach your students by using social media AND attempting to have them comprehend Shakespeare? Why not combine the two? Due to a careless moment, Romeo's cell phone was destroyed when he dropped it on Verona’s cobblestone streets. 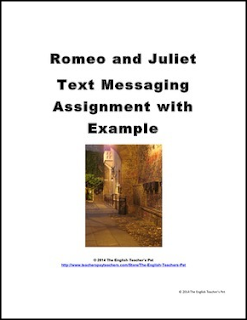 Your student's job is to recreate the text messages that were lost from Romeo's phone. Students choose a scene in the play to recreate in text-language. 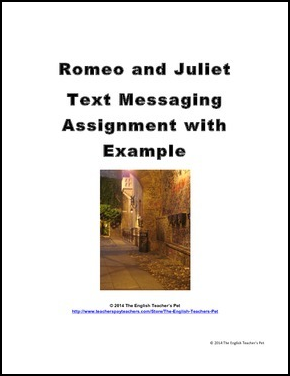 This seven page document gives a fun- yet school appropriate- lesson for students to recreate a scene from Shakespeare's Romeo and Juliet. Included is the assignment and evaluation explained, an example to model from, and printable sheets of texting balloons for filling in the texts. Ready to print and pass out; your students will love the update! Romeo and Juliet Tragedy Themes, Motifs, and Irony PowerPoint. Romeo and Juliet PowerPoint Game. Romeo and Juliet Introduction PowerPoint with Act I Questions.